Digital twins, deployed through a centralised resource or as compiled simulation applications, help design engineers shape tomorrow writes Brianne Christopher, Content Manager, COMSOL Inc.
Multiphysics software is invaluable for simulating designs, devices, and processes in engineering, manufacturing, and scientific research. One of the greatest challenges of incorporating simulation into product development is making it accessible to everyone involved. COMSOL turns this challenge into an opportunity with tools for creating and deploying simulation applications and digital twins. For simulation to be beneficial to the broader organisation, it must be accessible in two distinct ways. First, team members in R&D, manufacturing, laboratory testing, and design should be able to run analyses without relying on simulation experts. The Application Builder, available in the COMSOL Multiphysics® software, makes this possible. Applications provide all collaborators with the capability to perform simulations, avoiding bottlenecks in the development process. Simulation should also be accessible in the field so engineers can run real-time analyses onsite. This is possible by deploying applications through COMSOL Server™ and COMSOL Compiler™. COMSOL Server™ provides centralised access to simulation for specialists, design teams, R&D teams, and more. COMSOL Compiler™ makes simulation accessible in an even broader sense. Simulation engineers can use this new product to compile applications into standalone executable files that can be deployed to anyone, anywhere. Application users can open a compiled application and run their own simulations without a COMSOL® licence or internet connection. 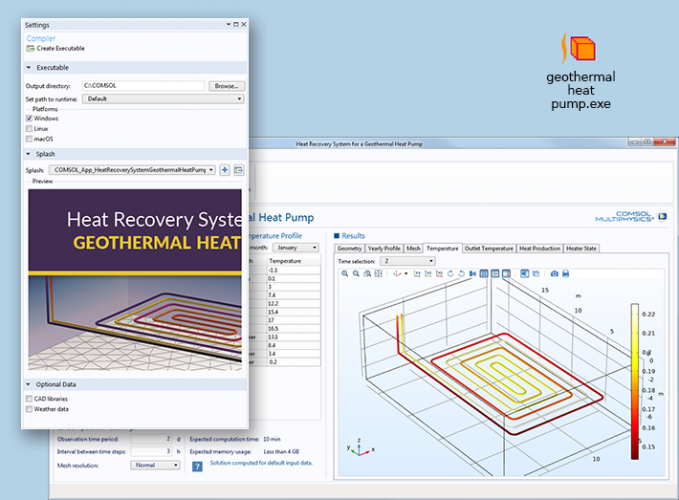 The heat recovery system geothermal heat pump application, with custom icon and splash screen, shown as an executable file after clicking the Create Executable button in the Compiler Settings window. Industry engineers and researchers are already accelerating product development by building numerical simulation applications and distributing them throughout their organisations. For example, one materials science company uses COMSOL Server™ to deploy applications to the right contributors at the right time, helping their teams collaborate in the development of innovative products. Widespread access to simulation applications and digital twins allows design engineering teams to tap into their greatest asset: each other.